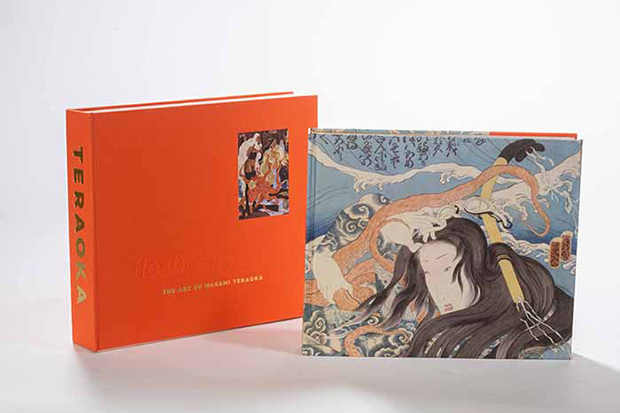 Artist Masami Teraoka’s brand-new art publication, Floating Realities: The Art of Masami Teraoka, is a beautiful collection of his work throughout the decades. Sans text, the book tells a story through his abundant and relevant imagery and offers audiences a compelling visual experience. Born in Onomichi, Hiroshima-ken, Japan in 1936 but trained and working in the west, Masami Teraoka has lived a long and prolific career that’s crossed borders as well as time. His works, which tend to depict a modern social or political narrative (i.e. the AIDS epidemic, abuse in the Catholic Church, and the Lewinsky scandal) are often done in a traditional style. His work has been featured at the Tate Modern, the Metropolitan Museum of Art and of course, the Honolulu Museum of Art. Another powerful aspect of the book for us here at HoMA is that it’s dedicated in memory to our late curator of contemporary art James Jensen. The two had a long history together—working together on events and exhibitions at HoMA—and shared a mutual love of contemporary art. The limited edition run published by CSU Fullerton consists of 400 pages, 335 plates and several personal photos. Floating Realities has been published in two styles: the standard edition includes a dust jacket for $75, the special edition comes in a beautiful clamshell box (fabric bound, inset detail image, embossed with a silkscreened title and bone closures) for $150. The books are available in the Shop starting now. Stay tuned for a book signing in early 2019! How do I order the book from the website/shop? There is No price & no order form. Thanks for your inquiry! The book will be up on the website today or tomorrow. In the meantime, feel free to order by contacting the Shop: gro.muesumululonohnull@pohs or call 808-532-8703.